Nineteen-year-old Carrie Ann Bell is independent and spirited. The only thing she really fears are the Union soldiers fighting against her Confederate friends. When her youngest sister runs away from home, brave Carrie Ann is determined to find her and bring her back. Disguised as a soldier, she sets off--only to find she's fallen into the hands of the enemy. Soon, though, she finds herself drawn to the handsome, gallant colonel. He rescued her, protected her, and has been every inch the gentleman. Carrie Ann discovers that her foe has become her ally--and more than that, someone she could love. But the arrival of Joshua in the Union camp as a spy will test her loyalties. Will she protect someone who has been like family or be loyal to this stranger to whom she wants to offer her heart? When her world is being torn apart around her, whom should she trust? 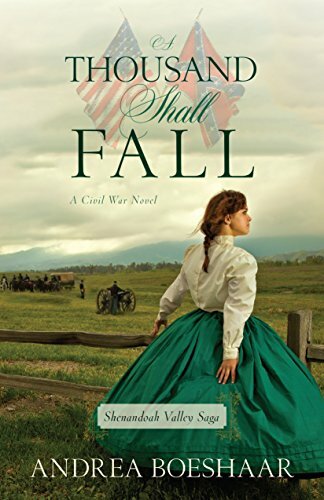 Set against the backdrop of the American Civil War, A Thousand Shall Fall is framed around compelling characters and a very romantic setting in Virginia's Shenandoah Valley. Andrea Boeshaar’s extensive research guarantees historical accuracy and romance genre enthusiasts and Civil War buffs alike will enjoy the Christian perspectives on actual historical events. I couldn't put this book down, page after page I was taken back in time to the Civil War era. The research that went into this book was what made this book for me. I found myself asking my husband now what side was that General on? Not to worry though the answers to my questions were in the next few paragraphs. Great descriptions put me right into the action, although some may be gruesome to think about. The author had me remembering that this war was not just fought in open fields but went right into the heart of our towns and cities. It destroyed so many lives and homes along the way. I loved reading about Cara Ann and her strong character. It was refreshing to read about woman in that time era that wasn't going to let anyone push her around. She also was caring, hardworking, and a good Christian woman. You can only hope and pray for the best for her throughout the book. Then in the midst of all the turmoil was a budding romance. enjoy the Christian perspectives on actual historical events.